The Zagato Mostro is using a Maserati V8, so expect it to have up to 460 hp like the GranTurismo MC Stradale. The Milanese coachbuilder is expected to produce no more than ten units after its Villa d’Este premier. Some say the rest of the car including all the carbon fiber bits came straight from Belgium instead of Italy, but that hardly matters. What’s important is the styling, and in this case the exterior designed by Norihiko Harada plays homage to the 1957 Maserati 450S Zagato Coupé Costin, a car built specifically to be raced at the Mille Miglia by Sir Stirling Moss. So, is it a Maserati, or is it a Gillet Vertigo? You tell me! Either way, the interior is as spartan as the original car’s was back in the fifties. Zagato is a regular guest at the Villa d’Este, but this year, their creation will have to grab more attention than a certain race car that was quickly cleaned up after Sunday and is currently being driven from Torino to Lake Como to join the party. 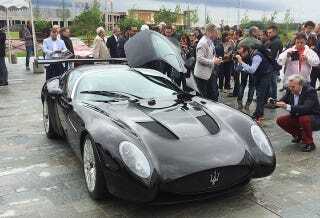 Then again, the Zagato Mostro sounds Maserati V8 enough to qualify as a worthy contender. Photo credit: Quattroroute via Instagram. Hat tip to Graziano!